Trying to sell a home in today's market can be a real challenge. Traditional sellers might not be able to compete with the rock-bottom prices that make distressed properties so appealing to some buyers, but their competitive edge lies in owning a well-cared-for, nicely upgraded, move-in-ready house. The trick is to stand out from the pack with a nicely detailed home. You don't have to spend a lot of time or money on these easy upgrades--any of these projects can be completed for under $1000 and in a weekend or less. You'll get the most value if you do the work yourself, but if you plan to have the work done by a contractor, make sure you shop around for several different bids before choosing one to work with. 1. Upgrade your kitchen appliances. 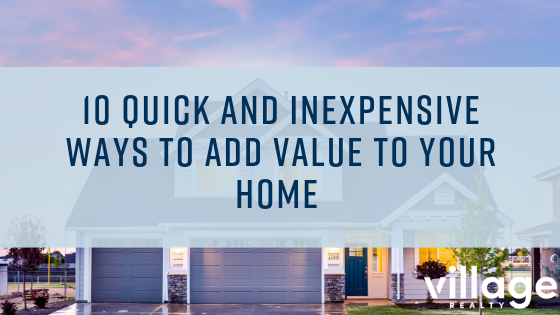 This is perhaps the quickest and easiest way to add value--all it really requires is a bit of shopping on your part--but it's also one of the more expensive upgrades you can do. Still, it could be a worthwhile investment, considering that upgraded kitchens are the #1 selling point for a home. Be price-savvy when choosing appliances, and remember that you're shopping for a cost-effective solution that looks great and pleases most buyers--not something that suits your own tastes. 2. Create interest with a backsplash. If you can't afford to replace appliances but still want to liven up your kitchen, try installing a backsplash to create interest. Laying backsplash tile is a fairly straightforward project that should only take an afternoon. Try to choose something neutral but classy that also coordinates well with your current design scheme. Subway tile is a classic choice, and glass tile is very popular at the moment. 3. Freshen up your paint. Fresh paint offers the biggest bang for your buck as far as quick upgrades are concerned. You can paint entire rooms or just accents and trim, or both. Again, you're trying to appeal to the widest array of buyers possible, so choose neutral (but not boring!) colors, such as beiges and creams. Be sure to paint over any weirdly colored rooms (your son's neon green bedroom, or your favorite jewel-tone color combo in the master bath) so as not to turn off potential buyers. Even if you don't have the time or money to do entire rooms, even a quick freshening of white trim or other painted accents will help spruce up your home. 4. Install crown molding. Crown molding is such a simple feature, but it seems to wow most buyers. It's not too difficult to install yourself, assuming you get the measurements right and cut the molding correctly. If you're not handy, leave this project to a pro. Even having a contractor do a single room (like a master bedroom) can add value and will still only cost you a few hundred bucks. 5. Change out cabinet hardware. This one is so easy, it's almost a no-brainer. New knobs and hardware can really jazz up cabinets anywhere in your home, from your kitchen to your bathroom. Changing them out involves nothing more than a screwdriver and a 30-second attention span. Get your kids to pitch in to make this a fun family project that should take you no more than an hour or two to complete. 6. Replace light fixtures. This upgrade is also easy as it only requires only a few minutes of simple installation. Replace any outdated fixtures with contemporary ones; ditch the ugly 1980s brass chandelier in favor of a sleeker modern version, or replace that tacky bathroom vanity fixture with something more elegant. Update your front porch light fixture for maximum impact and curb appeal. 7. Give your bathroom a facelift. If totally replacing an outdated tile-surrounded tub in your bathroom is out of the question, consider having these surfaces refinished or reglazed. This is a job best left to professionals, but it is a quick and easy fix that, at $200-600 for the whole job, is a far cheaper option than doing a full bathroom remodel. Clean white tile is in right now, so going in this style direction might just work in your favor, especially if you combine it with other easy upgrades like new paint and light fixtures. 8. Clean, unclutter, and stage. Tidying up and getting rid of clutter doesn't cost anything, but the positive impression buyers get from a clean and neat house cannot be overstated. Create easy storage with inexpensive shelving, baskets and crates, and other matching containers to create a less cluttered, more open-feeling space. Pull all the personal family photos and rearrange furniture for a better flow. You want potential buyers to be able to imagine themselves living there. 9. Instant curb appeal--just add water. Rent a pressure washer and give new life to the exterior of your home to create instant curb appeal. Don't forget to do your front walk and driveway while you're at it, as well as any other surfaces that need brightening. 10. Make outdoor spaces more inviting. Landscaping is one of the quickest and easiest ways to add curb appeal. Lay some sod or plant some flowering shrubs to enhance your outdoor spaces, paying special attention to the front of your house. You can also make your patio cozier by adding potted plants or an outdoor firebowl. If you don't already have a patio, add major value by laying a simple one of flat stones; with enough helping hands, you can do this in a weekend. You probably aren't going to get all of your money back when you sell, but you'll most likely be able to sell your home more quickly, and for closer to asking price. Sellers need all the help they can get when putting their home on today's hyper-competitive housing market, so use these tips to get a head start on marketing and selling your home. Last updated April 22 at 10:28 am.